The weather in my part of Virginia is forecast to be sunny and in the mid-50’s today. The possibility of snow is in the forecast for two of the next three days! This is a typical Virginia winter with a wide variety of weather to please everyone; highs ranging from 15 to 65 degrees, sunny, windy, rainy, a coating of ice, a dusting of snow, oh wait a minute, make that two feet of snow! As you return to your classroom in this new calendar year for a new semester of teaching and learning, your students will exhibit an equally wide variety of achievement levels and readiness to take on new tasks. 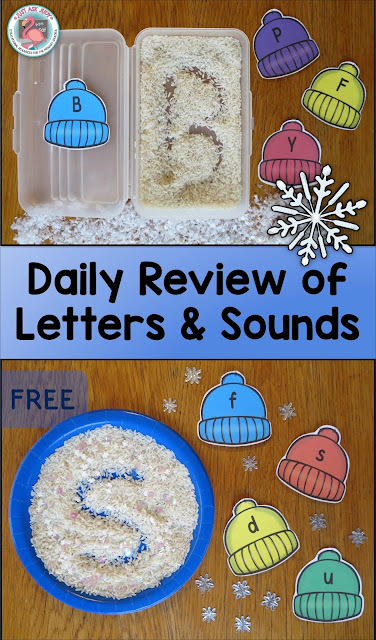 Some of your littles will undoubtedly still need a daily review of letters and sounds. In December, I wrote about ways to review letters and sounds employing the visual, auditory, kinesthetic, and tactile senses. I shared a set of gingerbread man letter and number (0-20) cards. I want to build on the idea of using seasonal letter/ number cards and incorporating sensory writing trays into daily review as one way to enhance student engagement. SugarAunts wrote a terrific post on using Writing Trays for Handwriting. 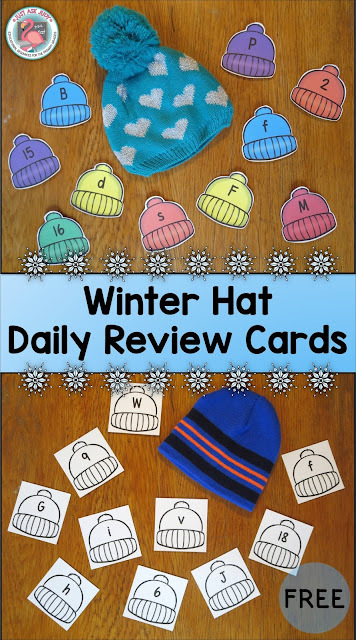 This month, I am sharing a set of winter hat letter and number cards to help engage your learners in daily review tasks. For the sensory writing tray, I tried white rice with glitter. Seriously, glitter is incredibly messy used like this and I wouldn’t recommend using it in a writing tray unless you want to see sparkles everywhere for weeks to come. On the other hand, white rice with sequins and snow sprinkles made a nice mix. I love the idea from Kindergarten is Crazy for using plastic school supply boxes; easy to contain, stack, and store, and so practical for use with small groups. As with the gingerbread men, these winter hats can be used in a plethora of ways, limited only by your imagination, including an It’s in the Bag activity. For students who have learned a limited set of letters or numbers, you can make multiple copies of those. Students take turns to pick a card (without peeking, of course) and respond. If the response is correct (or if you are providing corrective feedback), they keep the card. You can add the hedgehog cards for a little excitement (The Hat written and illustrated by Jan Brett). Pick a hedgehog card- lose a turn, put one or all of your cards back in the bag- you decide. Since I couldn’t find a winter themed decorative gift bag (out with Christmas and in with Valentine’s Day), I included a page with hats and snowflakes to decorate a kraft bag. 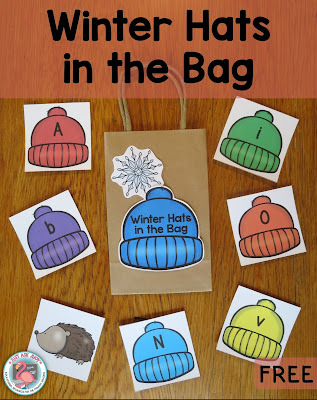 How will you use these winter hat letter and number cards? Let me know if additional seasonal sets would be beneficial. This free roam the room small group activity, available in my Teachers Pay Teachers store, gets your kids up and moving while reviewing initial sounds. 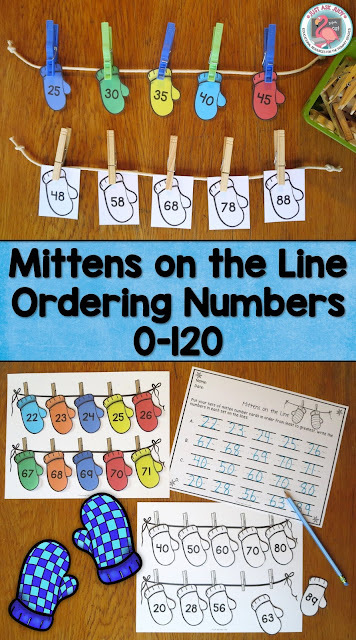 For learners ready for numbers beyond 20, check out my newest open-ended resource, Mittens on the Line Ordering Numbers 0-120, which is perfect for kindergarten, first, and, second grade. Click to find more winter resources in my store. 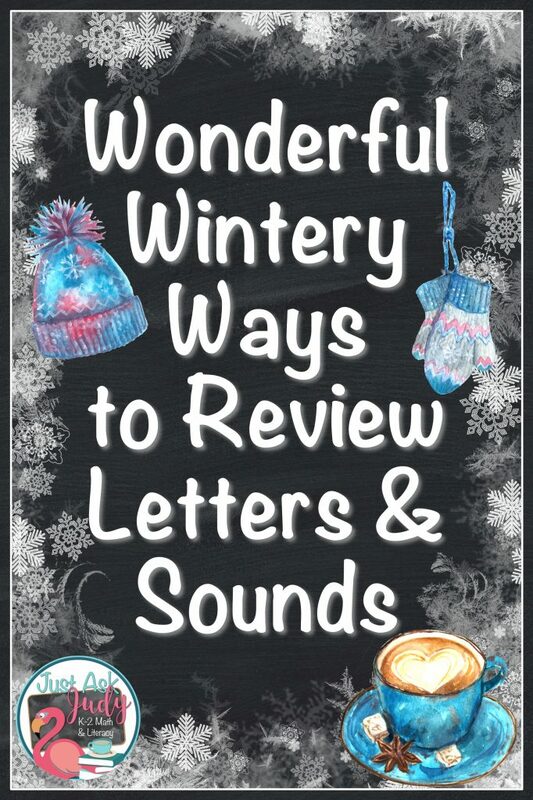 You can also find a sprinkling of additional winter hat and mitten resources on my Winter Wonders Pinterest board. Thanks for including our Icy Numbers Counting Mats!! 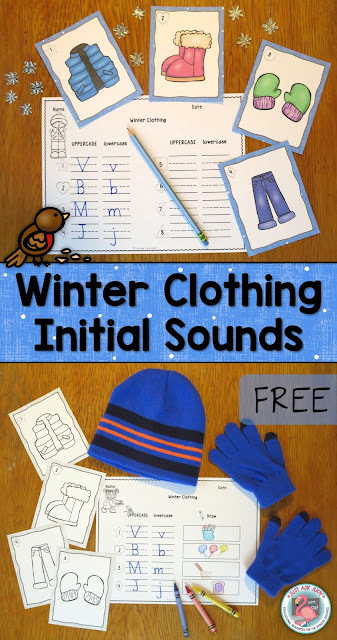 Your Winter Hat printables are such a great resource!